Explore Chicago at your own pace during this hop-on hop-off bus trolley of the city. Choose between a 1-, 2-, or 3-day pass depending on your trip time. See tons of highlights quickly, without worrying about navigation, and enjoy onboard commentary from a local expert as you ride. You can also listen on an app if you prefer a language other than English. 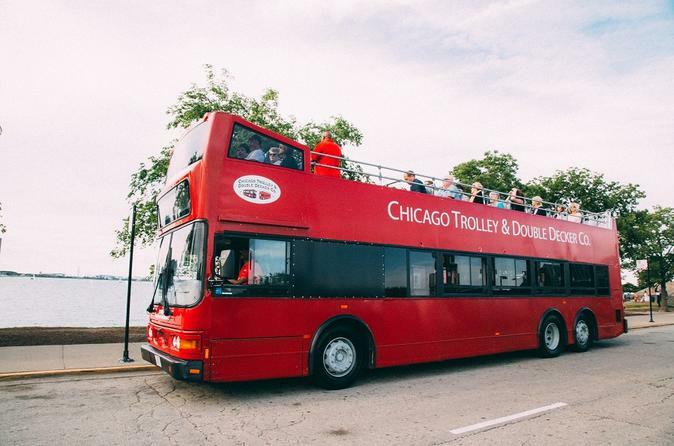 Your narrated trolley (heated in winter) or double-decker bus will tour 14 magnificent miles of Chicago's downtown areas including The Loop, The Magnificent Mile and River North, taking you by the city's premier shopping, dining and attractions. The tour is about two hours if you do not hop off. During the summer, your ticket includes the Night Tour and Wrigley Field/Lincoln Park Zoo Tour. These tours will return in Spring 2019. With a foreign language app available, you can choose to have the tour narrated in your choice of German, Chinese, Spanish, or Portuguese. Once you purchase your ticket, you can download the mobile app and select your language preference. Special Offer - Book with us and save 16% compared to another travel site! - Book Now!